‘You’re an anthropologist and you study… White people?’ I regularly receive a puzzled look from people when I tell them what I do. Anthropologists are supposed to study Indigenous tribes in remote locations, aren’t they? Or at least something exciting, like drug addicts or slum dwellers. When I explain further that I study White anti-racist people in Australia who work in Indigenous health, the confusion often dissipates. ‘I see, so you look at their motivations for working with Indigenous people’, they say, assuming that my goal is to question the motivations of White people and show that really they are racist. ‘No, I don’t look at their motivations exactly. I am more interested in what it means to identify as an anti-racist, and what this tells us about the whole project of helping Indigenous people.’ By this stage of the conversation, people either know exactly what I am talking about, or are more confused than ever. Finding this object of study was the starting point of my book. It was also the end point of ten-year journey that began in medical school in Melbourne in the early 1990s and ended in Darwin, four thousand kilometres and a world away. I became interested in Aboriginal justice issues as a university student, angry that the high standard of living that most Australians enjoyed was built on the denial of Indigenous sovereignty and the continued suffering of an impoverished minority. I joined a newly formed Indigenous solidarity group and arranged to do some of my medical training in a remote community in the desert. As soon as I finished my medical degree, at the age of twenty-five, I bought a second-hand car and drove four thousand kilometres to begin my internship at the Royal Darwin Hospital. I arrived in Darwin between Christmas and New Year’s Eve. Humidity was at its annual peak, and for three days I felt I was in a fog, unable to think of anything but the oppressive heat. I soon began work at a hospital where most patients were Aboriginal. The air-conditioned hospital was too cold for them, and the concreted area outside the main doors buzzed with life, with young kids running around and family groups sitting and talking in various Aboriginal languages, eating chips from the cafeteria and passing around cigarettes, with tubes and bags of bodily fluids protruding from hospital gowns. Not long after I started work I became interested in the public health research institute next door to the hospital, a place where dedicated non-indigenous researchers worked alongside indigenous researchers and community members to find better ways to prevent and treat disease. I attended their weekly meetings and eagerly listened to tales of community health promotion projects where researchers supported local people to identify and resolve their own health priorities. Their presentations were littered with happy snaps of Indigenous people cheerfully participating in the research, kids playing up for the camera, island beaches, lily-strewn billabongs and damper roasting on the fire. In my personal journey of methodically applying myself to what I thought to be the most important cause in the most effective way, public health research seemed the next logical step. Finally, it was me that was flying on a tiny plane to a remote community, shyly meeting the council chairman and thanking him for letting me visit, explaining our project to Aboriginal Health Workers at the health centre with the aid of a brightly coloured flipchart, and tentatively trying out the Aboriginal language phrases I had learnt. After a few years of intermittent remote community work, combined with long stretches in front of a computer in town, translating the work into quantifiable outcomes and lists of remaining challenges, a felt a growing sense of unease. The rhetoric of the institute promised that adopting the principles of self-determination and Indigenous control would lead to effective public health measures that would ‘close the gap’ between Indigenous and non-indigenous health outcomes. But in practice, all the measures to increase Indigenous control seemed to have the greatest effect on white researchers, making them wary of what they did and said. I realized that what I had ‘learnt’ in my time at the institute was more about the moral politics of race and identity than innovative strategies to address disadvantage. I began to form an answer to that fundamental question I sometimes asked myself in times of frustration, a question that haunts many White anti-racists described in this book: ‘What the hell are we White people actually doing here?’ In the course of the research that led to this book, this question developed further: ‘When a group of intelligent, well-meaning people, supported by the state, attempt to enact a mode of difference that is non-oppressive, does this make any difference?’ Trapped in the Gap is an attempt at an answer. 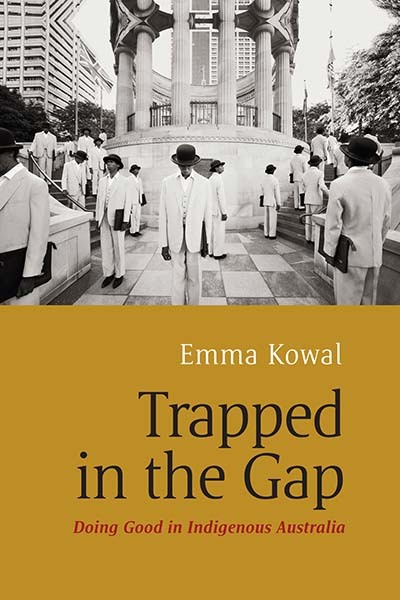 Emma Kowal is Associate Professor of Anthropology at Deakin University, Melbourne. She has also worked as a doctor and public health researcher in Indigenous health settings. She has published widely on Australian postcolonialism, whiteness and anti-racism, is co-editor of Moving Anthropology: Critical Indigenous Studies, and is an editor of the journal Postcolonial Studies.